School boy. Buff Bay, Jamaica. 2006. Our prayers are with the people on the island nation of Haiti. It is a terrible tragedy so close to home. In the coming weeks all our prayers and support will be needed to come to the aid of our neighbors. Below are some links to support agencies that are already on the ground assisting the survivors of this disaster. Please offer support financially if you can and prayerfully (which you can). There are many avenues of giving, so please choose carefully as scams abound when disasters occur. For this post I included this image from a trip to Jamaica (having never been to Haiti) because it was my first experience in the island cultures of the Caribbean. When I visited Jamaica, the topic of Haiti’s problems was discussed. 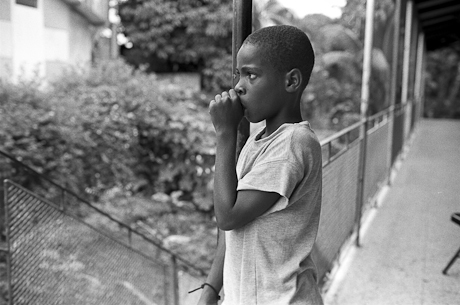 Jamaica has its own problems with crime and poverty, but to a much lesser extent than Haiti. When the earth groans and travails beneath our feet, shaking our confidence in ourselves and in the governments which cover us with that thin veneer of peace and security, people turn to God. Some as a demonstration of that so-called foxhole religion, but others in a true, newly discovered need of God and his comfort in uncertain times. It is much too early to speak of a “bright side” to such a horrible tragedy. But as time creates a comfortable distance from this event, many will rejoice over the new believers who will come to faith and in a new level of understanding and engagement of the people of this country for the long-ignored needs of people in a country so close to home. Unfortunately, many will view the images of this disaster and quickly remove it from present concern to the category of past events, a safe distance from personally connecting with the important lessons of this and other tragedies. This strikes at the core mission of AMPP. We hope to keep images of need in the forefront of peoples’ minds. The more engaged a person is in the needs of others, the greater their awareness and reliance on God to meet their own needs. This is a good thing. Railroad tracks. Kaçanik, Kosovo. 2009. We live in the present, and every evening brings an end of a day that will never be relived. Yet, we mark some days as special because they mark more than just the end of a single day. The end of December 31, 2009 brought the end of a year and a decade. I wanted a photo in this post that connected the past to the future, and a reminder of the ecclesiastical truism that there is nothing new under the sun. This set of rails is in the town of Kaçanik, Kosovo. 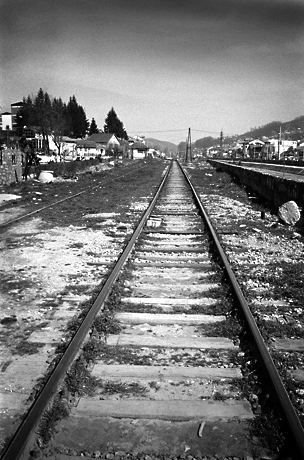 I stood looking down the tracks toward the past, only ten years prior, when 31,000 Albanian refugees fled the Serbian forces evicting them from the country, “getting ‘a free ride to Macedonia’ as a ‘gift from the government’ in exchange for the houses and cars.” They traveled these rails by train and by foot, fleeing for their lives. Thousands never made it, primarily those males aged 13 and up who were of “fighting” age. Every few years we are shocked anew by atrocities visited upon one people by another. Why do we still look upon these with horror and surprise? We look on with horror because we are amazed at actions of depravity, evil wholly outside our sphere of experience. We look on with surprise because deep down we wish the lie was truth; that man is getting better. Yet, we are continually met face-on with the truth of human nature; as Christians we should not be surprised because human nature is the manifestation of sin nature. Christians should look at the future with an element of pragmatism. Do not think that everything will be getting any better, but be not concerned with that. Will the economy recover or plummet anew? Will Iran comply with the demands of the west? Will Afghanistan come under control or fall into deadly chaos? Will Russia continue to provoke neighbors in a display of nationalistic machismo? We don’t know, and it’s not that we don’t care, but our outlook does not hinge upon events out of our control. We know that all things are in the total control of our heavenly Father. Happiness, blessing, fulfillment, contentment –however you want to define it– should be based upon being in that prefect will of God, solely. All other so-called measures of blessing or affliction are really neither. We just meet them with an attitude of openness to God’s leading and purposes, or we grasp and claw at temporal vanity. So, we wish everyone a happy new year, blessed in the understanding that God has a purpose for us. We continue here in the turbulence that is the human experience because we emissaries of the one, true King. What a blessing it is to need no other thing.